One of the most common online security mistakes people make is using the same password over and over again. This allows a hacker to gain access to all of your online accounts if the password at a single site gets compromised. Most sites store your password in what is called a Hash, which is a non-reversible process to store your password and making it impossible for a hacker to know what your actual password is. However, some sites don’t and store your overly used password in plain text. Once a hacker has your username and password they use tools to test that login against popular online services like Facebook, Dropbox, Evernote, gmail, etc. The easiest way to prevent this is to use a different password for each online account you create. What are you supposed to do with all those passwords then? That is where a password manager comes into play. Password managers assist in creating and storing logins for multiple websites behind a single master password. Clients for all operating systems: Windows, Mac, iOS, Android. If there is no mobile client you’ll be struggling to type in those complex 14 character passwords into your smartphone. Ability to sync data across all those client devices. Two of the most popular password managers are 1Password and LastPass. We will explain using 1Password since that is the one we prefer. One of the main reasons we prefer it is because a lot of mobile apps have begun to integrate with it directly. Installing 1Password is easy. You can install it on your PC or Mac by downloading the installer from the 1Password Website (https://agilebits.com/onepassword). The iOS and Android versions are available on their corresponding App Stores. 1Password allow syncing of data with either Apple’s iCloud or Dropbox. We recommend Dropbox since that option will allow your to use 1Password on non-Apple devices such as a PC or Android phone. Mac: Go to File > Preferences > Browser and click Install Browser Extensions. PC: Since Dropbox is the only option is will allow you to select your Dropbox folder on initial setup. 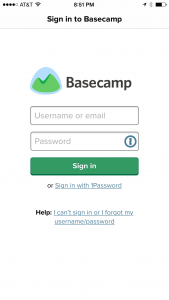 At this point you can begin logging into websites normally and 1Password will prompt you to store your login credentials. We recommend logging in and storing your current passwords then returning to change passwords later. 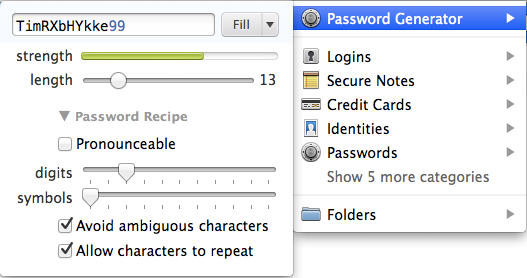 1Password will even show you which sites you use the same passwords on as part of their Security Audit feature. Signing up for new websites is easy as well with 1Password’s password generator. When prompted for a new username and password you can simply click on the 1Password icon in your browser’s toolbar. Logging into websites is also easy. When you are at a login page for a website you have previously saved a password for just click on the 1Password toolbar icon to select the password for the site you’re on. 1Password goes beyond saving passwords for the sites you browse. You can also store it to save bank account details, frequent flyer account number and any other sensitive information. For help installing, configuring, or using 1Password please contact us at support@noventech.com or give us a call at 630-595-5200. PreviousPrevious post:Beware of Fake Domain Renewal NotificationsNextNext post:Windows 10: Should I Upgrade?